The ongoing atrocities by Saudi Arabia and its “coalition partners” in Yemen reflect powerfully – and horribly – on both the U.S. and UK. That’s true not only because those two countries in general are among the closest allies of the Saudi regime, but also because they are specifically lavishing Saudi despots with the very arms and intelligence being used to kill large numbers of Yemeni civilians. The American and British governments have long been overflowing with loyalists to the Saudi regime (recall how President Obama literally terminated a state visit to India [where he ironically spent his time “lecturing India on religious tolerance and women’s rights”] in order to fly to Riyadh to pay homage to the Saudi King upon his death,along with top officials from both parties).One of those many Saudi regime loyalists, conservative British MP Daniel Kawczynski, appeared on BBC’s Newsnightprogram on Friday night and was mercilessly grilled by host James O’Brien about support for the Saudi war in Yemen by both the British governments and the country’s private-sector weapons manufacturers. The BBC deserves all sorts of criticisms, but this interview was a masterclass in how journalists should interview politicians and others who wield power. The whole interview (video below) is well worth watching, as O’Brien repeatedly demands that Kawczynski address the war crimes being committed by the Saudi regime he supports. But I want to focus on one point in particular. Because the investigation is into whether or not weapons sold by British companies have been used in the commission of war crimes possibly committed by Saudi Arabia. . . . The Houthis are not our allies and are not our customers. Therefore, the public interest of British journalism is not served at this point by investigating what they have or have not been doing. We sell weapons to Saudi Arabia. Embedded in O’Brien’s explanation is a vital point: the primary role of journalists is to expose and thus check abuses committed by their own nation and its allies. As O’Brien notes, “the public interest” is served far more by focusing on the bad acts of one’s own government than on the acts of foreign governments for which one is not responsible and over which one has little or no control. This ought to be so obvious as to be axiomatic. But the opposite is true: the vast, vast majority of media coverage in the west – and of foreign policy discourse generally in the U.S. – is devoted to some formulation of “hey, look at all the bad things that our enemy tribe, the one way over there, is doing.” It’s impossible to quantify with precision, but as someone who pays a great deal of attention to American media and “foreign policy expert” discussion in the U.S., I’d estimate that 95% of that discourse is devoted to the supposed bad acts of adversaries of the U.S., with maybe 5% devoted to the bad acts of the U.S. itself and its closest allies. It’s exactly the opposite of the “public interest” standard O’Brien accurately defends. I first noticed this on a visceral level when there was a huge outpouring of protest and anger from American journalists over the Iranian government’s three-month detention of the American-Iranian journalist Roxana Saberi (until she was ordered released by an Iranian appellate court). What was notable wasn’t the anger itself: it’s natural, and noble, for journalists to defend free press rights of their fellow journalists. What was so notable was that their own country’s government – the United States – had imprisoned journalists for years without charges of any kind, including an Al Jazeera journalist for almost seven years at Guantanamo, and most of them said absolutely nothing about this. All of that was barely reported. How can you be an American journalist and focus extensively on Iran’s abuse of journalists while completely ignoring your own government’s? That event for me demonstrated a critical point: it’s so fun – and so easy – to highlight and protest the bad acts done by the countries declared to be the Bad Ones by your own government. It’s not quite as fun or easy to highlight and protest the bad acts done by your own government itself or its closest allies. Yet as O’Brien pointed out, journalism is far more valuable, and the public interest served far more, by doing the latter rather than the former. That’s true because journalists can serve as a watchdog over their government far more effectively than over the governments of far-away adversary countries. But even more so, there’s never any shortage of light being shined on the bad acts of adversary governments: exploiting the bad acts of adversary governments in order to disparage, discredit and thus weaken them is something virtually all governments do. It’s called propaganda. Citizens in most countries hear a great deal about the bad things done by adversary governments. What they hear far too little of are the bad acts done by their own government, which is why journalism is most valuable when it shines light on that. That’s when journalism is informing rather than amplifying tribal propaganda. There are lots of reasons why people prefer to focus on the bad acts of the Enemy Tribe rather than one’s own. A big factor is strategic: when the focus of Americans is on the bad acts of Putin or North Korea or Iran or whatever Villain of the Moment is being featured or on the injustice of those places, their focus is not on the things they can actually do something about: the bad acts of their own government and the injustices in their own society. Constantly directing people’s attention to bad things being done by other tribes is simultaneously distracting and distorting: it creates the impression that Bad Things (imprisoning journalists) are only done by Them, not by Us. But at least as big a factor is a psychological one: humans intrinsically feel better when we are condemning others rather than ourselves. That’s why bitter, judgmental gossip has long been a favorite past time: it’s self-soothing to sit in critical judgment of others. There’s a reason the Gospels has to remind human beings to “first take the plank out of your own eye, and then you will see clearly to remove the speck from your brother’s eye”: it’s precisely because the universal temptation is to ignore our own flaws since that’s so much more self-flattering and pleasing. None of these are absolute rules; some caveats are needed. There’s a benefit from knowing about the acts of adversary governments. We want reporting on those countries as well, and journalists assigned to those countries do their job by highlighting the conduct of those governments. Nor should the bad acts of adversary governments be expressly denied or actively minimized, as that becomes its own form of deceit and propaganda. And then there are times when the bad conduct of other governments produces such great human suffering that collective action becomes both possible and justified, in which case focusing on it can be justified. “My own concern is primarily the terror and violence carried out by my own state, for two reasons. For one thing, because it happens to be the larger component of international violence. It’s not only “easy” to “denounce the atrocities of someone else.” It’s also profitable: strategically, propagandistically, psychologically and emotionally. That’s why it’s such a popular thing to do. It’s been true for decades in the U.S. and still is: write or talk about the invasions, bombings, tyrant-support and torture by your own government and you’ll immediately face demands from nationalists that you focus instead on Russia, upon pain of being accused of being a secret Kremlin agent if you don’t. That is what also explains the obsession among some westerners to depict Islam, rather than their own governments, as the Prime Force of Violence and Aggression. It’s also what drives the tactic of minimizing your own country’s sins by pointing to someone that is doing worse. It’s just pure tribalism in its most classic and primitive form: it’s the Other Side that is always the Bad One. Journalistically, that behavior is as cowardly as it is inconsequential: Americans and other westerners have been inundated for decades with demonizing language about U.S. adversaries from Russia to China to Iran to Muslim extremists. There’s very little valuable, and nothing particularly courageous or interesting, about sitting in the U.S. echoing those self-serving, self-pleasing and already widely accepted narratives. What Americans have lacked, woefully, is a journalistic focus on the bad acts done by their own government, a direct challenge to the propagnadistic banalities they’ve been fed to glorify their own side. This superb interview by this BBC host is an excellent illustration of the virtues of adversarial journalism. Even more significantly, it demonstrates why journalism is most valuable when it is devoted to what is most difficult: namely, focusing on the bad acts of one’s own side, holding accountable those who wield power in one’s own country and those of its closest allies, challenging the orthodoxies most cherished and venerated by one’s own society. The British MP who was interviewed by Newsnight, Daniel Kawczynski, is now threatening to sue the BBC and its producer, Ian Katz, over the interview. 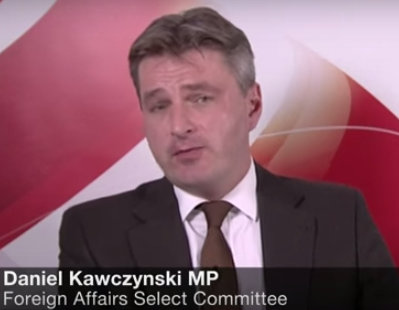 He’s particularly upset that after the interview, Katz posted the documents showing that Kawczynski received a “donation” from the Saudi Foreign Ministry to visit. As is so often the case, the most vocal tough-guy-warriors are such delicate flowers.